As we know, compression is all the rage right now. It has taken our running and endurance activities to another level by helping us recover faster and get back out on the trail sooner than ever before, to push harder and get results. Compression works. There are various compression products on the market. Last week we talked about compression shorts, this week we will focus on compression calf sleeves. 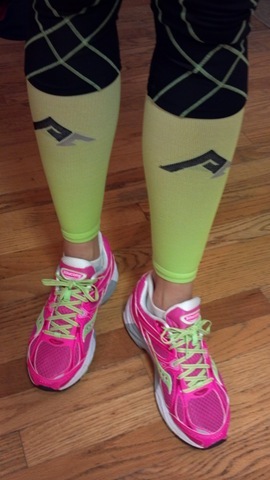 Regardless of where you run or race, you will see colorful compression socks or sleeves on many runners. Your feet and legs are your engine. Anything less than peak performance and full recovery means unnecessary discomfort while operating at less than your best. Change all of that with the advanced design and materials that make PRO Compression socks your ultimate recovery tool….. I was super excited to try out the Pro Compression calf sleeves. I know their calf sleeve line is new but they know compression. If I’m going to wear compression socks to work around the house with my slippers, Pro Compression socks are my first choice. So I was ecstatic to try out the calf sleeves for running. Regardless of whether you wear compression for function or fashion, I recommend trying out the new Pro Compression Calf Sleeves. I look forward to adding more colors to my line up! Pro Compression has generously agreed to give one lucky reader a pair of calf sleeves ($45 value), in their size/color preference. To be entered in the giveaway, please comment below and tell me what you prefer: compression calf sleeves, full compression socks or none of the above? You might also want to follow Pro Compression on Facebook HERE in order to be up to date on the latest specials! If you want to shop now, use the discount code: FIT40 for 40% off, plus free shipping. That brings the calf sleeves down to $27 each! Good deal! One winner will be chosen on Monday, December 17th at 9am. Good luck! This entry was posted in "Run"Way Fashion, Giveaways, Product Reviews, Running, Triathlon and tagged Compression Calf Sleeves, Compression sportswear, compression wear, Pro Compression Calf Sleeves by tootallfritz. Bookmark the permalink. I like them both at different times for different reasons. Full socks for running and recovery, sleeves for general wear throughout the day or for hiding under jeans! I prefer compression calf sleeves for running, so that I can wear my preferred socks. But I like compression socks for recovery. calf sleeves for me! I haven’t worn them while running…just use for recovery. I like the socks and sleeves for different reasons. For recovery during work hours, the calf sleeves are nice because I can still wear some dress shoes and no one can tell I’m wearing the calf sleeves under my dress pants. I like wearing the socks for race day and during workouts for more coverage. Compression calf sleeves for me please! I LOVE the socks for recovery and have yet to try the sleeves, but I think they will be very necessary once it becomes flip-flop weather again! I am excited to be entered in a drawing to win the compression calf sleeves as I was recently told by a physical therapist that women (especially) who spend significant time on their feet for any reason should be wearing some sort of compression sock or sleeve at all times to help prevent varicose veins as well as aid recovery from running. Every time I have worn full compression socks for longer distances, they mess up my second toenail and I keep losing he nail. Since switching to calf sleeves instead, my second toe is very happy in regular socks. I vote sleeves! I have never tried the compression sleeves but would love to. I have 3 pairs of the ProCompression socks and I love those!!!! Compression does work quite well…but be aware compression sleeves may not work for everyone. The first time I went to compression I opted for the “sleeves” and quickly discovered they caused edema or swelling around and below the ankle cause cut-off lymph and venous flow above the ankle. In my case…full compression socks are necessary to keep the pressure constant from toes up to top of calf below knee. Make sure you know if you are susceptible to peripheral blood flow issues before you invest….or ask to “test-drive” a pair you can return. I ended up giving mine away cause unable to return them once they were worn. CEP full compression socks work really well and they are not too thick that can’t be worn underneath a low-cut over sock and still fit comfortably in shoes. At least for me. Nice report and if by chance I end up a winner of the “sleeve” just donate it to another cause I can’t wear them! Sleeves more so than socks, and have been itching to try the Pro Compression ones. I have another brand and the band at the bottom tends to rub against the sliver of skin between the sleeve and my sock line. So I’ve been wearing the socks, which is ok because it’s cooler, but definitely sleeves. In pink. Or that lime. Something loud and obnoxious is always right up my alley. I don’t have anything like this and would like to try the socks. I prefer calf sleeves but will wear both!! I LOVE my hot pink calf sleeves!!!! I like the fun green color! I have a pair of CEP sleeves that I use, but I’d love to try these calf sleeves! I’m sold on both 🙂 I use sleeves on long/hard runs and socks for recovery! I would love to try the sleeves but have worn full socks for my last 2 races and my legs felt great afterwards! I have never tried compression socks so I do not have an opinion yet. I do use compression shorts and have found great success with those though. I love my compression socks but have never tried sleeves! I would live to see what they are like! sleeves or socks…Im not picky…would love to try either! I’ve never tried the sleeves, but I have two pairs of pro compression socks, which I love, especially for hills. I’ve never actually tried calf sleeves but I want to. I wear my compression sometimes to work and let’s just say my flats don’t cover the hot pink ones I have 😉 I wear my pro compression socks ALL THE TIME though. Love them! I’ve never tried the socks or the sleeves, but I would love to! I generally prefer compression sleeves as opposed to full compression socks. This is because I am basically in love with Injinji socks and love wearing them. So naturally I like my Injinji full compression sock (reviewed on my blog) but for almost every other company, I prefer the sleeve! So can I reply that I’m not sure? I’m relatively new to running and haven’t tried them but really want to give them a shot. Would love to try them! Haven’t gotten them yet, but would love to try the socks! I only have a pair of sleeves which I bought when I had a calf injury and love them. I like the sleeves like you so I can wear my favorite run socks. Full body? Yes! I love sleeves and socks. I think they both rock! I think I would like to try the calf sleeves! I haven’t tidied either but I think the the calf sleeves would be them way to go! I love compression socks but have never tried the sleeves. I do have to re-lace my shoes when I wear the compression socks however because they are thinner than my regular socks. I have a pain of sleeves (different brand) but would LOVE to try a pair of socks!! THanks for the chance to win. I have been wearing compression socks as I have found I need the support through my ankles and feet also. I have CEP’s which I love, but would love to try Pro’s!! I’ve never tried compression socks/sleeves yet! Winning a pair would be great…especially since I’m increasing my miles 😉 Can you say pink, PINK, P-I-N-K!!! I am new to the compression trend so haven’t gotten my hands on the sleeves or socks yet. I have only run with Compression socks, but would love to try the sleeves!! I have the socks in several fun colors!! Geesh, you’ve got some great giveaway lately AManda! I LOVE LOVE LOVE ProCOmpression! Ever since you let me borrow that yellow pair in the spring, I have worn ProCompression socks on nearly every long run and marathon. Absolutely love this brand! I prefer the socks… I need the green & purple yet! I am kind of torn! I really need to try some compression products to **hopefully** aid in my recovery. Maybe the full compression socks for these long runs I’m doing! I’m a calf sleeve gal! I generally prefer to wear socks after a workout for recovery, but I love the idea of sleeves to sleep in the night before or after a race. I also love the idea of sleeves to wear under dress clothes covertly at work! I love my full socks from Pro Compression. I even wear them to work on the days after long runs. So I would love to try the sleeves next. I have only worn socks for recovery. So I vote that as my choice. I need to try out the sleeve. I adore the calf sleeves. I must have them. Love the colors!! Only used socks and never tried sleeves. Would be interesting to try the sleeves. I haven’t tried the calf sleeves before, but I think those would work better for me since they’re more versatile.